When Joey of 80breakfasts asked me a few weeks ago if I would be interested in reviewing a book for a local bookstore, I begged off, worried I was unfamiliar with Lebanese, Moroccan and Turkish food. But I had a gnawing feeling, a “deja vu” of sorts. Then a few days ago, I was starting to get alarmed by the number of food related books in several tall stacks beside the bed, perhaps as many as 80-100 books in all! If they are still beside the bed, it usually means they are relatively new (acquired within the past year), or I simply have not had sufficient time to peruse before relegating them to the bookshelves. I sometimes read cookbooks before I go to sleep, but this pile is a bit bigger than normal. At any rate, I pulled out a few of the books which I think may be of interest to some of you. Particularly if you are looking for a holiday goody for yourself or a foodie in the house or among your relatives. Many of these books are available in Manila (mostly at Fully Booked), and certainly on-line in the Western world. 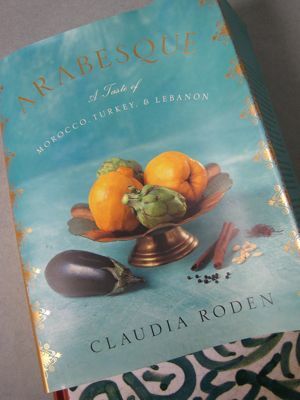 First up, AHA!, a cookbook entitled Arabesque featuring a taste of Morocco, Turkey & Lebanon. I bought this book last May when we were in New York and it was buried under other material until yesterday… Written by Claudia Roden, it has a stunningly beautiful cover, the gold design making it so “rich” in feel. The recipes look very manageable and the photos, while limited, are nice. I haven’t cooked from this one yet, but I know I will eventually. There is some background to each of the cuisines covered as well. Some recipes that caught my eyes: Rishta Bi Addas (Lentils with Pasta and Caramelized Onions), Tavuk Ce Domatesli Pilav (chicken with Tomato Pilaf), Tagine Bil Tmar Wal Loz (Tagine of Lamb with dates and Almonds). List Price $35. 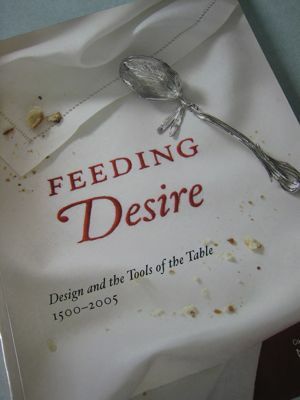 Another book that has been bedside for nearly a year is “Feeding Desire.” I had my eye on this book in the hardbound version but resisted temptation as it was whoppingly expensive. Then last Christmas, my sister sent this paperback version in a balikbayan box… talk about reading my mind. It is the ultimate “fishpan” item… it covers Design and Tools of the Trade with examples from 1500 to 2005. It has beautiful photos of some of the oldest and rarest table utensils, weaving its way to modern designs. Most of the items are to drool for, but never to be acquired. Some things are better in books of this sort, or museums for that matter. There is a tremendous amount of history in this book and I personally never thought you could go on and on simply covering the topic of say, a spoon. From ornate and silver to sleek and plastic, this is a great coffee table book. I must have guarded a silver vault at a fine manor in my previous life. They really did that, you know, sleep with the silver, literally. List Price Unknown, but pricey for sure, even this paperback edition. 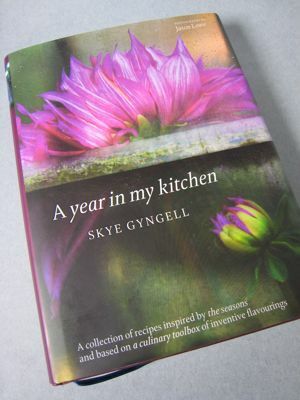 This book by Skye Gyngell about a year of cooking seasonal dishes at the Petersham Nurseries restaurant she runs is SUPERB. I really like this one and while I have read it practically cover to cover, it remains bedside because it is probably the book I WOULD have wanted to write had I been a real cook and had access to a wonderful nursery setting for my restaurant/cafe. An Australian born chef and later Vogue’s food writer in the U.K., she teamed up with the owners of a plant nursery to open Petersham Nurseries Cafe, in Southwest London. The photos are beautiful, the recipes simple enough (though reliant on the finest produce) and I wouldn’t be surprised if this won the best cookbook award or other such accolade from the industry’s highest brass. A MUST HAVE in any serious cookbook library. List Price approx. $50. The fourth selection here is essential in another way. I am not a great wine drinker, and as such, am always flummoxed when asked what wine to pair with what food. Thank goodness we (Mrs. MM and I) are blessed with several friends who are big winos (I jest) and they almost always bring fabulous wine when we invite them for dinner. 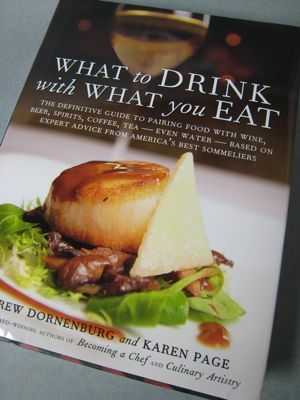 So when I read a review of this new book by Andrew Dornenburg and Karen Page called “What to Drink with What you Eat,” I was excited and ordered it from Amazon for May delivery when we were in NY. It is EXCELLENT. Not condescending as perhaps “Wine Pairing for Dodos” might be, but comprehensive and easy to use… For Szechuan food, for instance, the book suggests Beaujolais, beer or Riesling or Gewurztraminer. The book doesn’t just cover wine… it does tea, coffee, beers, champagne, sodas, etc. For French Fries, surprisingly, it suggests Champagne…hmmm, I HAVE to TRY THAT! The book is extremely well organized and one can look up a particular wine to find what foods go best with it. For example, for a Sauternes (French White Dessert Wine from Bordeaux), they suggest Almonds and Almond desserts, Custards, etc. This is another MUST-HAVE for a good cookbook/food book library! List price $35, and worth every penny. While these books can appear quite pricey (actually they are discounted some 20% if ordered on-line), I have always felt a good or even mediocre cookbook or food book is totally worth the price of a single restaurant meal. With a cookbook, I can get years of use and even if I only cook 2-3 items that work really well, it is worth the investment. My test of whether a cookbook is down-to-earth and close to the common foods of people in a country is whether or not there is a recipe for taro (also known as colocasia in Italy, kolokasi in Cyprus, qolqas in Egypt, and gabi in the Philiipines). Does it rate a mention in Claudia Roden’s Arabesque? (It did in the 1001 Nights – and I am glad to see it recorded here in Market Manila with text and beautiful food photos). Peter, I have just quickly glanced the index of the Roden book and it does not appear to have a recipe including taro root. However, I haven’t read the entire book so it might be called something else… btw, I think I have taro root posts not only as the root, but the leaves and recipes as well…(search gabi, laing, taro root in the archives). They say a man’s books says a lot about the man. So what are you,MM? I think you are a Fresh Lumpia! Complicated but delicate with a powerful BANG (the live garlic on top)! Me? I’m a rattatoullie. All mixed up and ready to go with anything but nevah, EVAH, over cooked! MM, you are super amazing!!! Two articles in a day….I cant even come up with one in a month!!!! hahahaha. Nice collection of books! Quite a bit of fortune if you total them up together enough to fund my retirement. How do you get in bed – you climb up in bed or you jump over in bed or you use a trampoline or pogo stick? Happy reading surely enough they broaden your horizon in any subject matter under the sun. I was listening to NPR the other day and they were interviewing people from California and New Orleans about what material possessions would they try to save from their house and it got me thinking I would try to save my cookbooks, all 2500+ of them! “Feeding Desire” was purchased at the Cooper Hewitt Museum giftshop in New York City in 2006. It was published in conjunction with a show of the same title. Available online as well. I suppose it’s for “fishpan” enthusiasts and table top aficionados. You do have an interesting selection of cookbooks(I personally love cookbooks and food lit. books as well)! Several times I would purchase on the basis of a very nice cover and paper. The first book seem to be an interesting read and Feeding Desire must be, too…my mom owns about 2-3 fishpans and appreciates stuff of this sort,too but won’t really spend a fortune on a seemingly interesting book. Haha, Apicio! You think others still remember/know Lilian Laing? (MM, do you?) Is she telling the truth or is Lilian Laing? Hehehe…Happy long weekend, Philippine-based marketmaniacs. Vote well and wisely. But may I just know where exactly is Salcedo Market located? Amor, from Makati Avenue going towards Buendia and just after passing Atrium, turn left onto Paseo de Roxas then turn right at Citibank and go two streets and turn left and drive 50 meters, you will see the smoke from the barbecue vendor… happy marketing! CecileJ, I have NO IDEA who Lillian Laing is…:) Hahaha. Does that mean I am still a spring chicken compared to some readers??? I am younger than MM but I DO know Lilian Laing. She is this big lady who usually plays this somewhat masungit/suplada role of being a wealthy but matapobre dona. I know this because i love Pinoy vintage (read: black and white) movies. I am envious of your last 2 books, MM. I am a wine idiot and stick to what i know and the “Year in My Kitchen” sounds just fabulous. Amor: if you want parking that isn’t a mile away go VERY EARLY (7-7:30) and have the pick of the produce. Have breakfast there. OR go very late (around 1) then you get bargains because it is closing time and the sellers want to sell their stuff, but then you get the “leftovers” which is still good. apicio, you blow me away. pity the younger set probably will not get it. lilian laing, indeed! i haven’t even thought of her in ages. and to think i’ve been having laing regularly. I found a recipe in Vogue Travel + Living from Claudia Roden for a chickpea salad which has become one of my go-to salads and always earns raves…I gotta buy that book! Hey joey, care to post that chickpea salad recipe? Is it middle eastern/indian style? hopefully with my time here in the USA I will have time to check what the bookstore has to offer here. I did not have time to visit Petersham when I was in London early this month but I also have few of Gyngell recipes. I want all four books!